"My breakdown was the best thing that ever happened to me," says Heather Carter as we sit in sunshine in the back garden of her Darlington home. It's a remarkable thing to say, but she says it very honestly. I met Heather when I was preparing for a skydive. In an article ahead of the jump to help raise money for St Cuthbert's Hospice in Durham, I admitted to my fear of heights, a fear so intense it would stop me standing on a chair to change lightbulbs. Shortly after that, an email arrived from Heather. "I can treat your fear of heights," she offered, an offer duly accepted. Heather is a practitioner in Emotional Freedom Technique, which she describes as "an energy meridian therapy which helps people to realise their personal potential by overcoming stress, blocks to creativity, confidence and health issues". She speaks from personal experience, for Heather has not always been a practitioner in such things. She found her way to EFT when a previous career proved to be the wrong one. She said: "I was working in local government in a job that I probably was not best suited to and that resulted in my having a breakdown. "From the first week in the job, I knew I had made a mistake. I went right back to all my old insecurities, that frightened child within me. Every time, I was asked a question I was made to feel inadequate for the job. "I was on a spiral down for three years. I hadn't been able to cry for about a year. "I was driving home from work on a Friday afternoon after an incredibly stressful meeting. I drove home wanting to cry and all I could do was scream this hollow scream. "I went to work on the Monday and I had to go home." Her workplace helped her as much as they could, but for Heather, she knew it was time to move on, and it was the technique that had helped her cope through three years - including through a summer that saw her husband, Syd, survive three heart attacks - that Heather turned to. 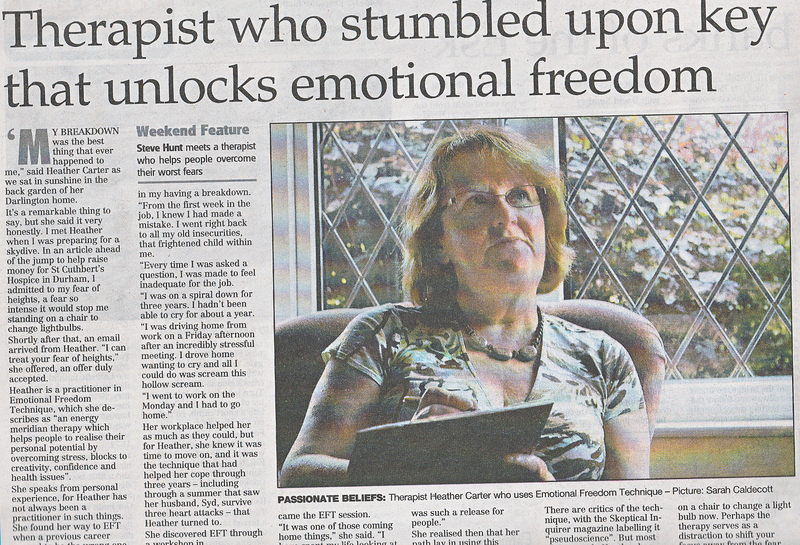 She discovered EFT through a workshop in Middlesbrough. It started out as a taster course, letting people try different kinds of therapies, and then came the EFT session. "It was one of those coming home things," she said. "I have spent my life looking at personal development. EFT just struck a chord. "I got a response from it in the first half hour doing the tapping. The whole process was seeking answers within yourself. It was just a sense of rightness. I could feel it had made a difference. "I came home, got on the internet, found out everything I could about it." From that "totally life changing" experience, Heather went to a conference in London, which she described as emotionally exhausting. She said: "There were people around the room in tears. It was such a release for people." She realised then her path lay in using this technique to help others. She said: "EFT was my future, it was time to follow my passion instead of following the need to earn a living." The therapy works by focusing on a specific issue - for me, my fear of heights - while tapping acupuncture points on your body. Heather has helped people with all kinds of problems using the technique - tackling smoking, depression, self-esteem issues, even physical pain in the case of one woman who had knee trouble, and the therapy helped her recover enough to run exercise classes. There are critics of the technique, with the Skeptical Inquirer magazine labelling it "pseudoscience". But most of the people Heather has helped have come to her through word of mouth from others she has helped, which suggests they have found it valuable, and listening to Heather talk about the technique is to hear someone passionate in their beliefs. Sitting through my own session, as I tapped each of the acupuncture pressure points with my fingers and talked about the reasons behind my own fears, at first I felt foolish, but came away feeling better, yet not convinced it would help tackle my fear. And yet I made that skydive - and even manage to climb on a chair to change a light bulb now. Perhaps the therapy serves as a distraction to shift your focus away from the fear, perhaps it reaches deeper, but it worked for me. It worked for Heather, too. From what could have been the deepest low in her life from that breakdown, it's served as a springboard to the much happier person she is now. She said: "The real me saw this as an opportunity. I could be the real me and admit that I was allowed to feel the way I was feeling." Somehow, life-changing doesn't seem a strong enough term to describe Heather's journey.